Oh. My. GOODNESS! Is anyone else still recovering from the Star Wars Rebels season 2 finale?! I know there has to be some of you out there; I noticed many tweets and comments on Instagram expressing the same feelings I was, freaking out about what happened to our dear Ahsoka Tano. I thought I was being crazy, having been ridden with anxiety all night while I was at trivia with my friends, knowing that this intense episode was happening and I couldn’t see it. But then, looking at the reactions of other Ahsoka fans, I wasn’t alone. Part of me has been embarrassed, feeling like an emotional wreck while out with my friends when I didn’t even know what was happening on this animated television series. But again, I’ve learned I’m not the only one. Ahsoka means a lot to her fans. We adore her. We were scared about what was going to happen to her. I believe in my heart she made it out alive, but that ending was a bit ambiguous to say that she absolutely survived, and I think Dave Filoni left it that way so that the show could focus back on the original Rebels gang for a while. 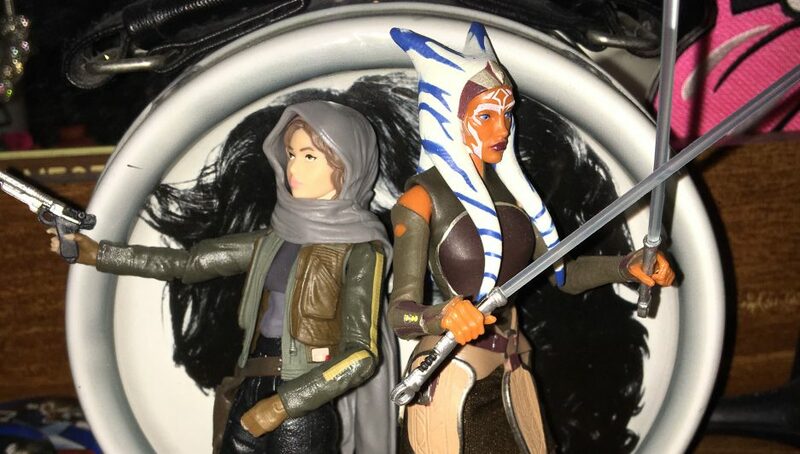 Which is quite understandable, but being the huge Ahsoka fan I am, I’m sad that she won’t be a part of the show for who knows (besides Filoni) how long. I think I got even more emotional watching the episode because, prior to this season, I honestly did not consider that Ahsoka would have felt guilty leaving Anakin when she left the Jedi Order. Did she feel responsible for what became of him? Did she feel like if she stuck around, none of this would have happened? Yes, I absolutely think she felt that way. And while she is absolutely not to blame, I do think her leaving the Jedi Order was part of Anakin’s path to the Dark Side. I read this article once before I even watched Clone Wars and it talked about how the show pointed out the flaws in the Jedi Order, and that Barriss Offee wasn’t entirely wrong to say that the Jedi Order was corrupt (though she was entirely wrong to frame Ahsoka so carelessly, so viciously done with ease). When Ahsoka was walking away from the Jedi Temple, Anakin admitted he thought about leaving the Order as well. Ahsoka knew he understood how she felt, and even that shows their beautiful bond as Padawan and Master, even more so as Brother and Sister. And my tear ducts were once again activated when they were dueling, and Ahsoka tells Vader “I won’t leave you…not this time,”, confirming that she definitely felt guilty and was even trying to make things right. Unfortunately, at this point, we know that’s not possible. Even Dave Filoni has said in recent interviews that Vader is the most affected by the presence of Luke. And that’s fine! It just adds to the tragedy of what Anakin Skywalker became, and how heartbreaking it must be for Ahsoka to see her dearest friend become the biggest monster in the galaxy and want to help, but she may have come to the realization that she cannot fix him in the hardest way. Aside from the heart-wrenching drama between former master and apprentice, that episode was crazy all around! Darth Maul, or rather, just Maul now, has returned!! And naturally, he’s causing our gang of Rebels lots of trouble! First, it both disturbed me and yet still amused me to see him imitate Yoda’s introduction from Empire Strikes Back, appearing as a helpless old man with a cane telling Ezra to put away his weapon, that he means no harm. LIES! It was also heartbreaking to see him blind Kanan, but then honestly, it was so cool to see Kanan fight back, using the Force more than ever before to help guide him. Also, small thing…but I kinda liked that Maul referred to Ahsoka as “Lady Tano”. Maul is still powerful, still evil, still badass and scary. I’m excited for more Maul in the next season! Look at that and just try telling me it doesn’t give you the chills and make you want to cry. And I don’t care what anyone else says, AHSOKA LIVES! !